Bonnie Joy Drebus (nee Rhodeback) age 79, passed away Feb. 5, 2017 at Brookdale Newell Creek in Mentor. She was born Aug. 8, 1937 in Springfield, Ohio. 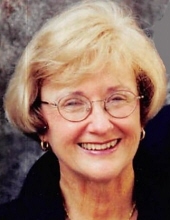 Bonnie was a physical education teacher for St. Mary’s Mentor and for the Willoughby-Eastlake schools. She cherished her grandchildren, and loved to play with them, and helped them develop their love for athletics, music, and artistic creativity. Bonnie donated her time and energy helping to decorate Lantern Court at the Holden Arboretum, as… well as creating floral arrangements for many friends’ weddings and gatherings. She loved to sing and dance, and performed for many seasons with the SELREC singers. In the winter months, Bonnie loved spending time with friends and family in Englewood Florida. Bonnie is the beloved wife of Donald L.; loving mother of Jeff (Beth), and Julie (Sean) Maroney; dear grandmother of Donovan, Zane, Sean, Cameron, and Delaney; sister of Jerry (Melanie) Rhodeback. A committal service will be held Friday Feb. 10, 2017 at 11 AM at Western Reserve Memorial Gardens Cemetery, 11521 Chillicothe Rd. in Chesterland. The family will receive friends on Thursday from 4-6 PM at Brickman Bros. Funeral Home, 37433 Euclid Ave. in Willoughby.